I was talking with some folks in California last week about the evolution of cubicles from the original "action office" where everything was movable to the modern view of cubicles as tiny jails with fixed walls held firmly in place by management policy and departmental will. Propst believed that the facility should adapt to the needs of the individuals, and there could be many forms of adaptation. But in the 1980s and 1990s, standards programs and the box move—move people instead of the office—became the predominant planning model. Workers had to adapt to the facility. What happened to a human-focused, individual-focused interior design approach? This is not an unfamiliar story. I think it has some parallels with other great movements of the past few decades in that some mechanical aspect of the original work is kept, but only after the humanity is extracted. 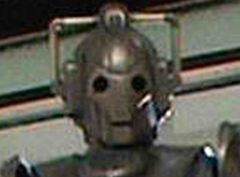 It reminds me of Dr. Who's enemies, the Cybermen, who "improve" human beings by removing all the humanity from them. This is the risk that faces the Agile software methods as large corporations "improve" it by twisting it into a plan-driven, ceremony-heavy way to extract effort from workers without sharing control. But on the topic of cubicles, be sure to read up on the change at Herman Miller Research. Don't miss his five rules for work environments. Some cubicle walls contain grids that support in-boxes, upright filing containers and pencil holders. If your cubicle wall contains grids, ask your manager about acquiring those items to assist you with efficiency in your work space.